Simply plug into any USB port on computer. Gently adjust the flexible neck to position the cool breeze any direction you wish. User can edit the LED message by software via connecting USB poet to computer(NO data cable is needed). Programmed text or message transfer by micro wave. Message can be kept permanently even when the power is removed. USB pore powered, no external power supply needed. Apply to PC,Laptop,PDA and any device with a USB port. CD-R software can be applied to Windows operating system only. 1. Do not touch the spinning fan blades. 2. Do not exert to much pressure on the USB connection when adjusting the flexible neck. 3. Keep your face and hair away from the spinning fan blades. 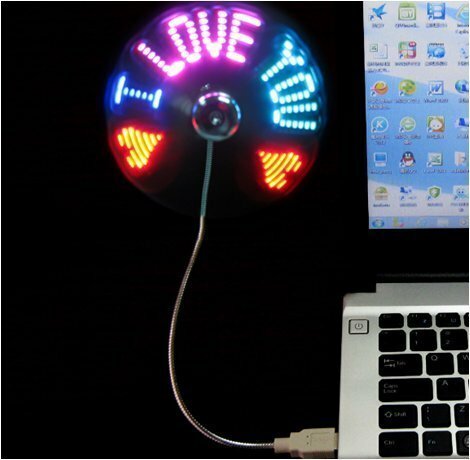 Keep cool and display cool messages at your office or on the go with the USB LED Message Fan. If you have any questions about this product by SAYTAY, contact us by completing and submitting the form below. If you are looking for a specif part number, please include it with your message.